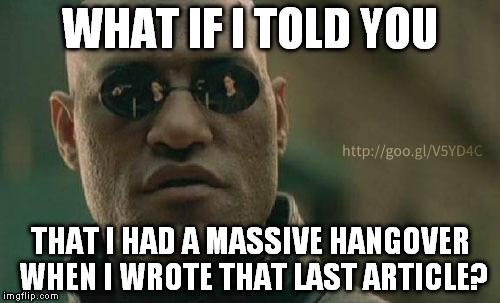 What If I Told You...? This is a kind of bridge article for "Christians, Heroes, and Hurt" and another that was previously unwritten, "Dealing with Important Things". In the previous article, I was discussing how some Christians get the bit in their teeth when people they look up to have a downfall. Sometimes, we find out that our heroes are crooks, and other times, we find out that people have other failings. In either case, we find out that people are human after all. Sure, we know in our minds that everyone has failings, but it seems that we tend to get a mite upset anyway when they show their frailties. The idea for this one came to me because I had a headache when I was writing the last one. I'm borrowing from Rush Limbaugh and illustrating absurdity by being absurd. (Come to think of it, I do that frequently.) While the haters take those "confessions" and spread them around, the rest of us can get on with this. The last one listed is true, and I'm not too fond of cologne. Maybe a couple of others are true, but I'm not telling you which. Last "confession": it was kind of fun making up that list. Maybe I should have used "confession bear"? One reason that I had a period of about fifteen years where I rudely put God on the back burner was because of the way many Christians acted. They — we — tend to get intolerant of people who do not act and think in a way that we think is best. Although I had been hurt, the problem was that I had unrealistic expectations, and took my eyes of Christ. Too many Christians do that. I reckon it's human nature to speak ill of others. Although atheists have a great time badmouthing Christians (with or without cause), there are Christians that like to gossip. That is beyond unhelpful, it is sinful (2 Cor. 12:20, 1 Tim. 5:13, Prov. 11:13 NIV). In fact, although it's good to sound warnings when someone is getting bad teachings, we can get burrs under our saddles in the nonessentials. "You believe / do not believe / do / don't do what?" A good part of the problem is legalism. People judge others on little details. If you smoke, drink, have a tattoo, slip up and take the Lord's name in vain, go to movies, play cards, these and a host of other things can disqualify you from being a good Christian in some people's eyes. (Take a look at "The Lie of Legalism" for a good article.) The title track on Steve Taylor's debut EP was "I Want to be a Clone". It talked about rigidity, legalism, church-ianity, man-made rules, and more. Guess what, pilgrim? This is rooted in pride! A powerful line in there was, "If you want to be one of his, gotta act like one of us!" What if I told you that in some places, Christians have a smoke and drink, and nobody thinks anything of it? People grow at different rates according to the Spirit's leading; there is a God, and you are not him. Sure, offer advice, counsel, teaching. We all need to be humble and teachable, as long as we compare what is said to us with Scripture, which is the final authority. I'm not talking about sins that destroy lives or disqualify someone from ministry because the qualifications of an elder must be taken seriously. People like Jimmy Swaggart, Jim Bakker, Kong Hee, and others found out the hard way, but their egos kept them going and some sheeple still follow them. Christ followers, if you find out about failings or just something you don't like about another Christian, and it's not a violation of biblical principles, let it go. If it's sin, serious error, or something else, admonish him or her with gentleness and Christian love. More biblical truth and love, less judging. Less hurting, especially for no good reason. You savvy? Something that comes to mine with this article is Nehemiah. When Nehemiah is building the wall, an "open letter" is passed around and Sanballot, Tobiah, and Geshem, warn Nehemiah that word is spreading that he is planning on revolting against Persia and establishing himself as king. This is a very common tactic of the enemy even though the whole charge is completely made up. The tactic is in part to get us off guard and make us wonder "Am I really doing this for God?" or get us to stop entirely because of the perception of others. Sometimes this is a legit concern, but be watchful of who this message comes from. If it comes from a trusted friend, take counsel. If it comes from someone that has a history of trying to discredit you, you have no obligation to be concerned about it. Excellent point, Charlie. Ian Juby raised a similar point about chasing down distractions and personal attacks from atheists. Nehemiah was asked to be friendly by liars: 'Now it happened, when it was reported to Sanballat and Tobiah, and to Geshem the Arabian, and to the rest of our enemies, that I had built the wall, and that there was no breach left therein; (though even to that time I had not set up the doors in the gates;) that Sanballat and Geshem sent to me, saying, “Come, let us meet together in the villages in the plain of Ono.” But they intended to harm me. I sent messengers to them, saying, “I am doing a great work, so that I can’t come down. Why should the work cease, while I leave it, and come down to you?”' (Neh 6:1-3, WEB) We don't have time to be distracted from God's work, and Satan uses various emissaries. Yes, watch who it comes from, consider the source, compare with Scripture, and be faithful.